We don't come back here on the necessity to use hydrocarbons as source of energy in a hybrid architecture. It is necessary to wonder now about what a hybrid architecture supposes within a terrestrial vehicle. 3. What type of internal combustion motor in a hybrid architecture? - a motor: one notices that the electric motor can be common to several tanks; for example, the same electric motor can be theoretically powered either by the fuel cell, either by the batteries. Let's signal here the interest of reversible electric motors, that is to say having the capacity to become generators if they receive a mechanical energy. In the same way, some hydraulic motors with an appropriate design can work instantaneously like pumps and vice versa: for example, some pumps with axial pistons and inclinable plate. o these sources of energy raise the weight of the car, and thus increase the consumption. Moreover, the volume that will be allocated for the tanks reduces the space allowed for the passengers. o The coordination of every motor is complex and is only recently efficient with the progress of the electronic commands thanks to quick sensors and actuators. The difficulty grows exponentially with the number of actuators to manage. 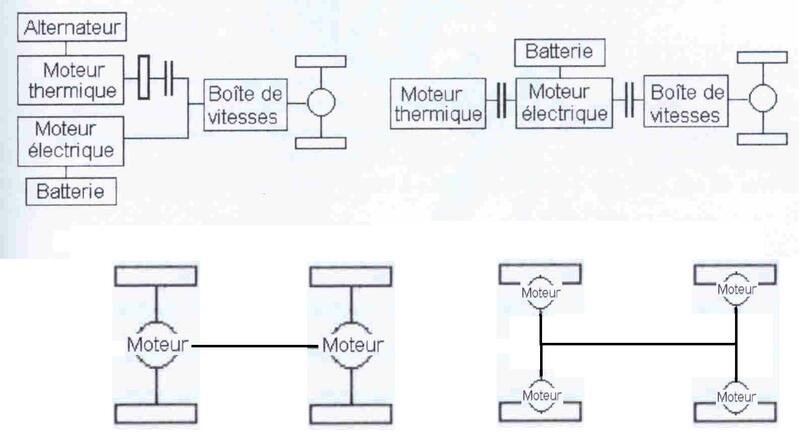 It is necessary to install relatively expensive and cumbersome devices to split the power like epicycloïdal gearings in order to connect several motors and to send their power toward a same mechanical receptor (parallel architecture), even though it is not still an obligation (serie architecture or total decoupling of the motors of type" 1 motor by axles "or even" 1 motor by wheel" if each motor is sufficiently small and powerful (Cf. Fig. 4.)). In top, architectures with only one propeler hybrid group on the left: parallel design and on the right: serie design. N.B. : A lot of combinations are possible: a thermal engine on an axle, an electric motor on the other, in the same way for the case of one engine by wheel, although a certain symmetry must be respected in relation to the plan of longitudinal symmetry of the car. o The purchaser of a vehicle, even with a very ecological mind, is not ready to pay 2 to 3 times the price of a classic car because the considered vehicle is equipped with several ways of propulsion that allow him not to pollute. o The subsidies granted by the States for the purchase of clean vehicles are already insufficient to absorb the overcosts of such vehicles, and if such vehicles become widespread (what is little likely in the immediate), they will disappear merely. As one saws it, the main problem of the hybrid architectures is the clutter. Therefore, the internal combustion engine must be the smallest as possible. It is an extremely strong idea of the hybrid architectures. Besides, it explains that the recently successful industrializations of hybrid vehicles have little gazoline motors with weak capacities (less than 1400 cm3 ), the Diesel being more massive. The problem is that the present architectures of the internal combustion engine (piston-rod-crankshaft, and even Wankel.) are incompatible with a strong power because of the restricted volume allowed for the thermal motor. We will come back on that for a long time because to solve this problem is the key-point for the development of the hybrid vehicles : their field of application is currently too limited, mainly with the city-cars with weak power (less than 80 HP), what marginalizes them in spite of the strong consequences that they could bring against the pollution. Actually, a hybrid vehicle has even potentially mechanical performances better than those of the same vehicle solely equipped with an internal combustion engine thank to conjugates effects of all its propellers, naturally until the lack of its sources of energy others that hydrocarbons. - a maximal power comparable to the one of a middle car of today, that is to say about 100 HP. - a modulable power : as one saws it, the maximal power is rarely used, especially in urban environments. Therefore, the ideal would be to be able to partially exploit the motor in order to reduce its consumption without undermining the maximum output power of the motor. We have there the 3 main ideas that are going to guide the whole design of new architectures of internal combustion engine. Everything that SYCOMOREEN has evoked until now isn't really revolutionary, but it is necessary to gather the pertinent and essential elements in a neat and coherent way to solve the problem..
From now, we are going to focalise to the center of the topic as introducing supplementary constraints that the motor SYCOMOREEN will have to respect and the matter is going to become more technical. Otherwise, whereas the explanations were up to here rather qualitative, some quantitative aspects are going to be introduced in the goal to elaborate general specifications for these motors. Evidently, the specifications have to respect what precedes, but at this stage of the design, SYCOMOREEN wish to be even more demanding. For it, we are going to be interested in the main shortcomings of the cureent internal combustion engine. Each of these shortcomings limits their efficiency in a more or less serious way and we will tempt to clear the important ideas aiming to attenuate each of the shortcomings of the present motors, while sometimes analyzing examples and some historic recalls. 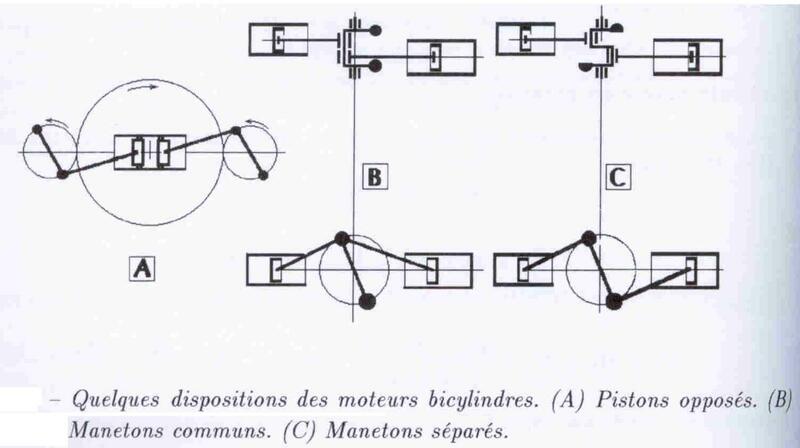 It is often assured only by the addition of rotating shafts unbalanced having no utility to transmit any power to the wheels, but compensating the inertia of the mobile pieces of the motor (especially pistons and rods... Cf. fig. 5.). It is in a way an ungainly and voluminous addition that looks like tinkering from a conceptual point of view. It is unfortunately a necessary pain for practically all motors currently known as soon as their speeds of rotation become elevated (more than 4000 rpm) because they are not intrinsically balanced. The vibrations that they generate are evidently ominous for the longevity of the pieces, for the transmission of the movements and for the comfort of the passengers. They also oblige to bring up the motor on anti-vibrant silent-blocks that dissipate energy, and therefoire indirectly create pollution, in addition to occupy a volume lost for nobler functions. With regard to the piston-rod-crankshaft architectures of motors (the most widespread), the vibrations have 2 origins : the movement of coming and going of the pistons and the movement of pendulum of the rods. Even though on some types of motors, some symmetries partially, or even completely balance the strengths of inertia of these parts (for example, the motors 6 on line cylinders, that BMW loves so much), one doesn't generally reach ever a complete balancing without the addition of rotating unbalanced shaft (Cf. fig. 6. and 7.). 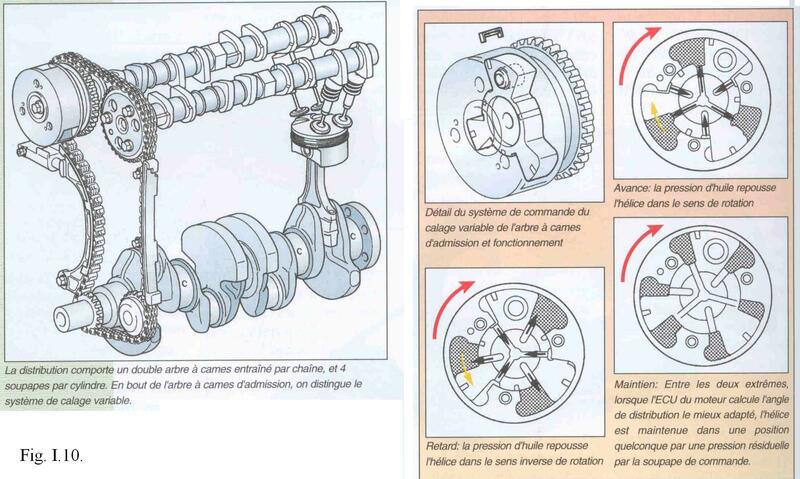 For the Wankel motors, of which only Mazda pursues with success its industrialization, the rotor possesses a movement epicycloïdal that is also difficult to balance, by mounting several rotors for example.. The volume generated by the movement of the pistons in the broad sense of the term is generally fixed for ever by the geometrical properties of the crankshaft. To make vary this volume is almost impossible on the motors with pistons/cylinders (it comes back to modify the excentricity of the crankshaft). On the Wankel motors , it is impossible because their kinematics is far too much constrained by the epitrochoïdal carter and the epicycloïdal motion of the rotor.. However, one can make the capacity of the motor vary while suppressing the action of one or several cylinders (or rotors on a Wankel with multiple rotors) in order to only use a fraction of the total power of the motor, what is finally sufficient under the condition to have numerous rooms of combustion : for example, on upscale motors including a big number of cylinders (or rotors), as the Cadillac Sixteen, that, as its name indicates it, has 16 cylinders in V, can operate in 4, 8, 12 or 16 cylinders modes (Cf. fig. 8.). This technique is also used on some german V12 (Mercedes, BMW...). One can theorically make vary the power by steps of P/n where P designates the total output of the motor and n numbers of its combustion rooms. Well evidently, so n is big, and so the capacity nearly varies continuously. But, for reasons of balance, the cylinders are generally extinguished by 4, more rarely by 2, and as regularly as possible all along the crankshaft to limit its torsion. Besides, so n is small, the liberty of regulating is more and more restraint, the case limits the monocylindre being equivalent to extinguish the complete motor ! More over, having identic rooms is not the optimal solution to have numerous combinations of possible output power. The variable wedging of the valves of admission and exhaust is extremely important to reduce the emissions of pollutants. It consists in advancing or delaying the openings and the closings of the valves, that they are of admission or exhaust, and this according to electronically piloting based on complex mathematical laws. The variable wedging sometimes consists, in addition to change the instant of openings and closings, to adjust the amplitude of movement of the valves, and thus the area crossed by fresh or exhaust gases. Most of the time, the variable wedging is achieved by piloting the rotation of a shaft (often with cams) in relation to another, it concerns the totality of the cylinders whose the piolted shaft manages the admission. One cannot manage every cylinder independently, what is bothersome if one wants to disactivate some (valves of admission and exhaust closed permanently) of it. It is not really a problem in the contrary case. Several technologies achieving this piloting exist : wheels with helical gearings, (fig. 9. 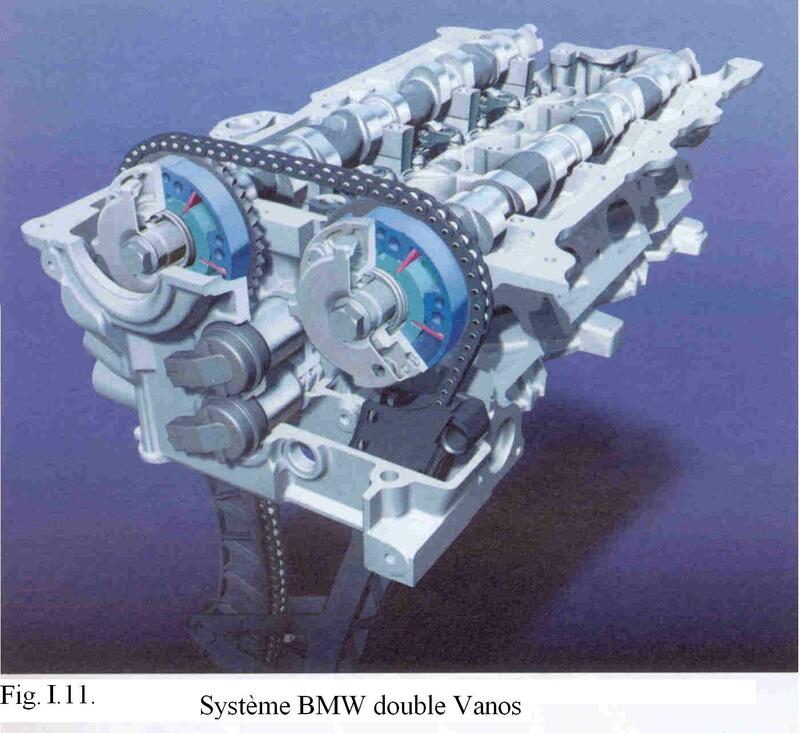 ), pressure of oil controlling the relative rotation a shaft(Toyota Yaris, system BMW Vanos, fig. 10. and 11.). They have in common to have limited amplitudes of piloted angle, relatively low (the frequency of the regulating must be weak in front of the speed pulsation of rotation of the motor), and to be all used on motors gas, either upscale or destined to city-cars, the 2 having a common demand for decreasing the consumption. Let's signal the existence of system "camless" projects - or, in good French", without cams" - (fig. 12.) 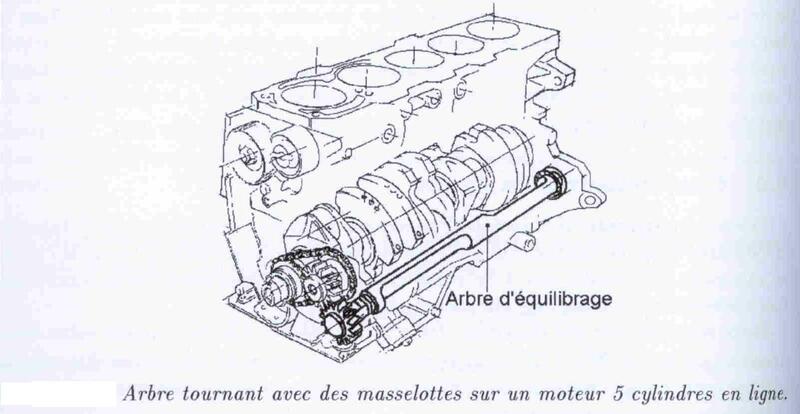 : for example, at Renault every valve would be ordered independently by an electromagnetic actionneur that would achieve to volontéde big independent déphasages of a cylinder to the other and a variable valve opening. But they didn't succeed for the meantime because they require an elevated electric power; it would be necessary to pass to" the architecture 42V" permitting to lower the amperage, and therefore the electric losses Joule, so that the system is really efficient. This architecture, announced a few years ago like a necessity to short-term (regardless of the Camless system), comes up against the resistance of the" standards 12V ", for which good number of accessories is conceived. It is not necessary therefore too to count on systems 42V in the years that comes, except to means-term. Finally, one of the rare mechanisms to pilot amplitude of valves' motions that are industrialized is the BMW Valvetronic (Cf. fig. 13). The volumetric ratio (or rate of compression) is the ratio between the volume of the combustion room at the top-dead-center and the one of this same room at the bottom-dead-center. The notions of points top or bottom dard-center, initially associated to the motors with piston-rod-crankshaft, can be generalized to all motor with deformable combustion room.. The volumetric ratios of Diesel engines are distinctly more elevated than those of gasoline engines. It is justified since at the beginning of the XXI'st century, Rudolf Diesel wished a spontaneous inflammation of fuel since its injection in the cylinder to avoid the use of any ingnition managing system. It required a strong pressure so that the aspirate air becomes sufficiently hot in order to burn the fuel instantaneously at its injection. Moreover, the fuel was little flammable for economical reasons : it was about heavy oils and dust of coal ! The corollary of this gait is the more massive structure of this type of motor (to support strong temperatures and pressures). that slowed down the implantation of such heavy engines on the cars. The use of more flammable Diesel fuel, and the improvement of the resistance of the materials solved this problem : in the sixties, the Diesel really appeared for the cars. Since the nineties, the high mastery of Diesel injection , with the help of high pressure injectors and pumps, of which Bosch is currently the leader - after having bought some patents to Fiat - ., allowed the Diesel engines to supplant the gasoline motors in the cars! It is an incredible revenge when one knows that they have been reserved a long time to the contraptions of yard, trucks and tractors and that the young fans of GTi (gas) of the eighties, who looked at their father's berlin Diesel with a scornful air, now find the pleasure of drive that they are searching for in the German TDis! 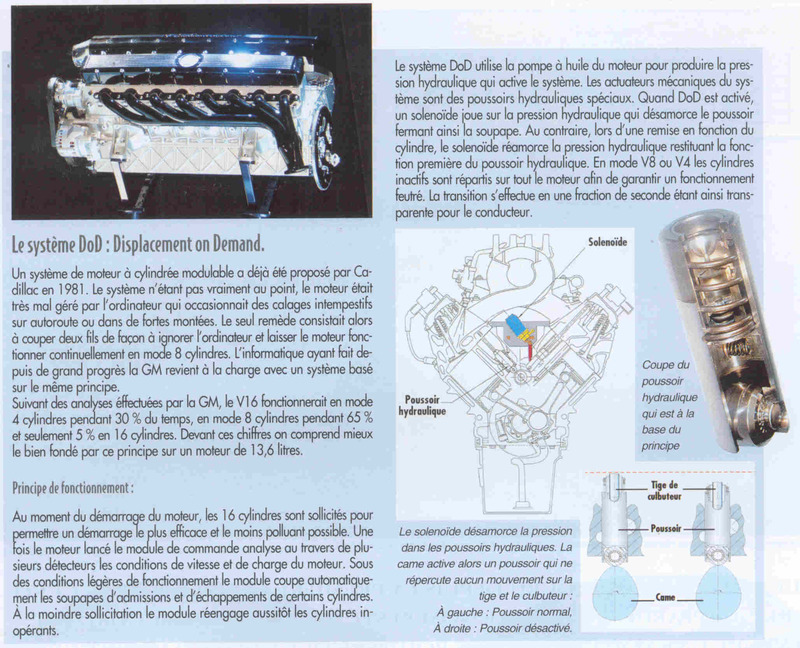 However, the volumetric ratios know important variations from an engine to the other, particulary for the Diesel highly overfed: one sometimes lowers this ratio until 7 to limit the maximal pressure in the cylinder. It goes in the same way for gasoline turbo engines, but in less important proportions. The constructors are besides more reticent to overfeed gasoline engines because it less easily supports the pressures and elevated temperatures, whereas the Diesel motors are designed straightaway in this optics. On the other hand, the phenomenon of detonation of the gasoline engines complicates a few more their overfeeding. Also, few manufacturers industrialize the overfeeding gasoline (one can mention the motor Audi 1.8T 150 HP and Saab 2L Turbo 210 HP). The overfeeding consists, with the help of a pressure of overfeeding, to inspire in the room of combustion a quantity of air superior to the one that it could coming in without this pressure, that is to say to the ambient pressure outside of the motor (about 1 Bar according to the altitude). The pressure of overfeeding is generally gotten with the help of a turbine aspirating the outside air for the motor and driving it back in the rooms of combustion as the valves of admission open up. The presence of this turbine gave the denomination of "turbo motors" to the overfed motors. The mechanical power provided to the turbine is usually recovered on the kinetic and thermal energy of the exhaust gases when they are pent-up out of the room of combustion. 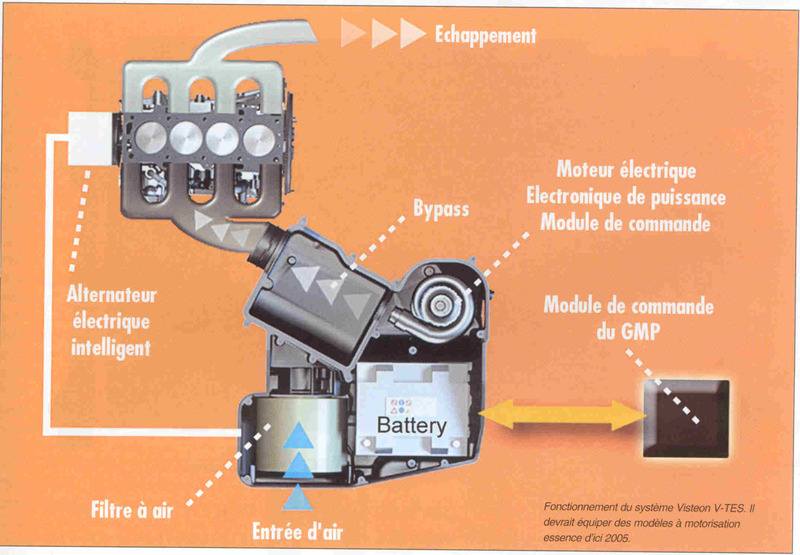 However, other processes are foreseeable : some manufacturers of components as Visteon propose an electric compressor for example 12V capable to convert an atmospheric motor into a turbo engine , the gains announced in power are about 10% on the torque and 27% in consumption (fig. 14.). 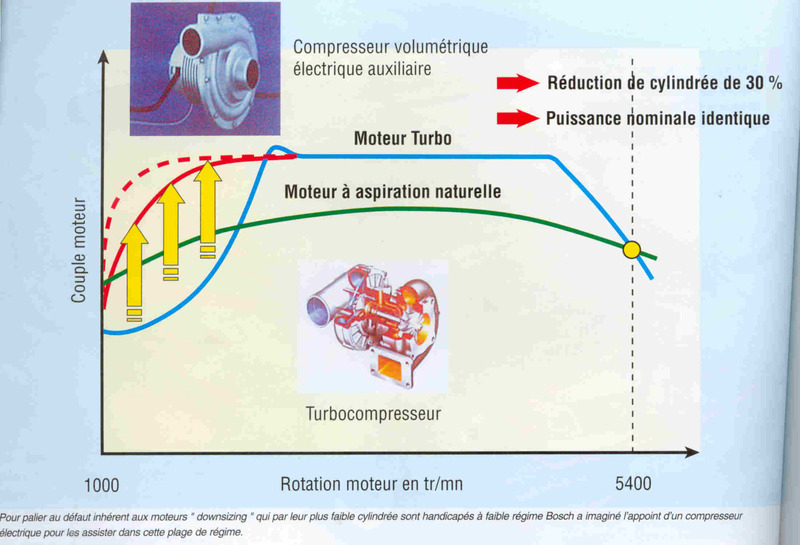 During a long time, the turbos have been used to increase the power of the motors to the detriment of their consumption : the introduction of a bigger quantity of air permits to inject more fuel, therefore to obtain more energy for a same motor cycle. But since some years, with more and more strict anti-polluting norms, the political rise of the ecological movements and the limitations of speed, the turbo has more and more an anti-consumption goal and it is besides the basis of their working since they succeed in recovering an energy in the gases of exhaust that would be lost completely otherwise. Another advantage of the turbos is to meaningfully increase of the torqueof the engine at low RPM (fig. 15. ), what is appreciated for the re-raises because it avoids to retrogress too frequently and permits to lower the middle value of the motor RPM with ascorollary an economy of fuel. Nowadays, some vehicles are even equipped with a double turbo : one efficient at low RPM, the other to high RPM, what drives either to the strategy of the downsizing (typical example : Volkswagen TSI: 170 hp with an only 1,4 Liters engine), either to the strategy of the hyper power (BMW V10 engine 510 HP mounted on the M5). But we saw that the turbos, according to the pressure of overfeeding, impose a variable volumetric ratio to extract all their potential; it is one of the difficulties of exploitation of the present overfed engines. Rarely cars makers like Saab develop variable volumetric ratio engines (the SVC) based on a toppling over of the cylinders in relation to the axis of the crankshaft via an eccentric. This motor is at a middle step between the prototype and the industrialization and require probably expensive supplementary parts (rods, pivots...). In the same way in France, MCE-5 tempts an adventure with a different kinematics, but which is at the same stage than the SVC of Saab. The most often, turbo engines have a volumetric report fixed once for all, that are a compromise between a non overfed use (in slow motion for example) and a full power working (in the case of a strong charge for the engine.). It is inherent to the 4 times cycle (admission, compression, explosion, exhaust) that use most present motors. With regard to the engines with cylinders and pistons, every cylinder only presents one motor time. (the third time). And this only during 2 revolutions of the crankshaft, what is very little if one wishes to have a good regular torque for the motor. The 2 cylinders engines arrive to 1 motor time by round of crankshaft, and so forth (n cylinders, n/2 motor time per revolution). For the Wankel monorotor, the situation is a little less bad since it gives 1 motor time per revolution of the output shaft, and either for n rotors, n motor time per revolution. However, only a weak variation of the value of the torque around its temporal average permits to tow the vehicle efficiently because the motor will choke itself less between 2 motor times.For a given capacity, it is therefore better to have numerous rooms of combustion if one wishes to have a regular torque, that one only and big room of combustion. The motor won't consume more and will yet have more powerful traction capacities. Otherwise, as one saw it at the time of the analysis of the shortcoming n°2, it is also interesting as regards to a piloted variation of the output power. o The sweep is never perfect ; some burnt gases remain in an imprecise proportion in the cylinder, what embarrasses the admission of cool air. o The uantity of heat to evacuate by the cooling circuit is nearly doubled in relation to the same motor that would function with a 4 times cycle. o Heavy Diesel engines with very slow RPM (about 200 to 800 RPM) and strong power (several thousands of HP, more than twenty cylinders) equipped with sophisticated systems of cooling ( water or oi coolingl especially, motor block and valves.). They are generally used on the ships, coupled to a generator to get electricity, or directly to the helix of the boat. One will notice that for these 2 applications, the reduction of the pollution is not a major worry. In a context of limitation of the pollution, one cannot use this type of motors because one doesn't sufficiently know the mixture of fresh air and burnt gases to inject the right quantity of fuel. In general, injecting too much fuel in order to be sure to really consume the whole present dioxygène in the room is the chosen way of facility, what is evidently very pollutant (generation of unburned hydrocarbons) in addition to not to be economic. 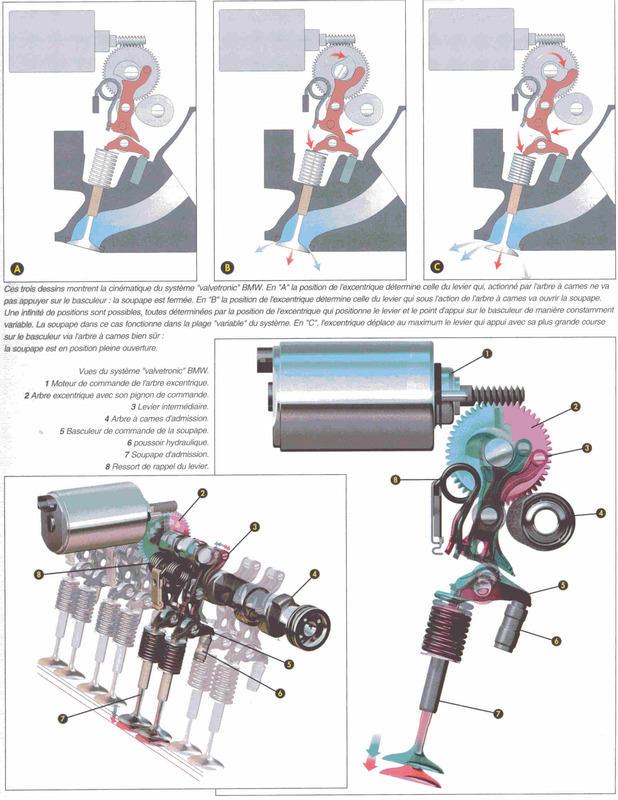 Problem n°1: 2 revolution of crankshaft for only one time motor by cylinder ! The kinematics piston / rod / crankshaft has the very big drawback to require 2 rounds of the output power shaft to achieve the 4 times cycle for every piston. 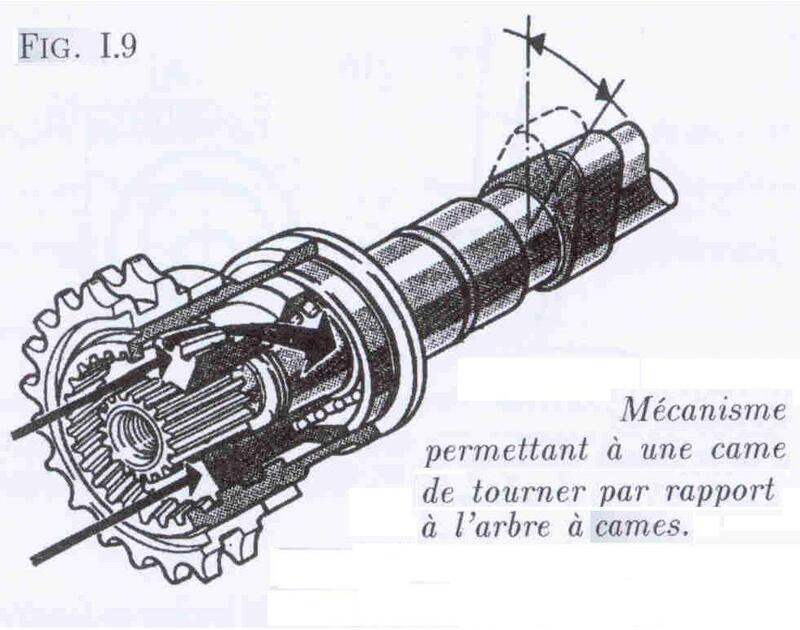 Whereas a kinematics permitting the same cycle on 360° (and even 180°...) of motor abre would multiply the volumic power of the engine respectively by 2 and by 4. One can mention to this topic that theWankel motor known for its compactness, get 1 motor time by revolution of the power shaft. * the piston undergoes maximal and uselessly too long thermomechanical constraints : it ruins the hopes of HCCI engines and other neighboring ways (high charge compression ignition, CAI, ATAC...) besides because the pistons don't resist with the violent prolonged conditions of the detonation. * the high energies and pressures of the TDC encourage the creation of nitrogen oxides (NOx), particularly polluting in city because they are aggressive for the respiratory system and lead in combination with the solar radiance to ozone (O3), also very dangerous for health when it is located on the floor. * the admission deserves to be long because it is on this phase that is played the good replenishment in fresh air of the cylinder, and therefore the power of the engine. * the compression must begin meaningfully as soon as the BDC is reached so that gases warmed themselves well at the end to the ascent of the piston, especially about increasing temperature before the injection of fuel for Diesel or direct gasoline injection. 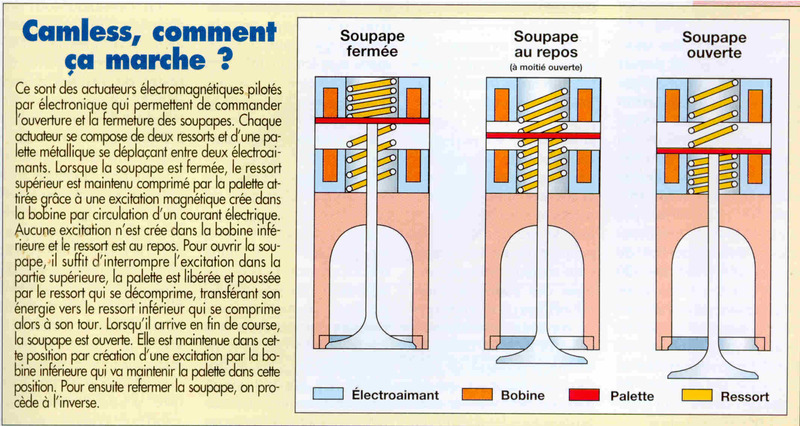 * the exhaust must begin meaningfully as soon as the BDC is reached : although it is the least noble phase of the cycle; it is necessary to clean the room of combustion as soon as possible for the admission of fresh air without losing energy by lamination of the exhausted fluids. § specific volumes as those intended to the implantation of an alternator, of various pumps are excluded. § This reference of 2 rounds is necessary to use directly the total volume of cylinders of 4 times cycle engines with crankshaft, rod and pistons. § This volume corresponds to the fresh air charge inhaled on 2 rounds by a non overfed motor (in the normal outside conditions of temperature and pressure) , running on a 4 times cycle, while supposing that the replenishment of the rooms takes place ideally. For the Wankel engines or the traditional motors with cylinders, the architecture imposed by their design makes this compactness be a number extensively lower to 1 (< 0.1). However, nothing forbids on 2 rounds a very superior compactness ! While calling P the maximal power of such motors, they would have very important volumic power, defined by P / Vmot, what would make of them some ideal candidates for a hybrid architecture !